Dox4Lyf and Ant4Lyf are meant to be insanely crazy game modes with some interesting and downright funny differences from the base game. Both mods revolve around their entitled unit. They change many small things about the game but make it a far different experience. While they have similarities, the strategies used are almost polar opposites! The original version of the Lyf series is Dox4Lyf. Here, Doxen are the only units that can be built by the bot factory. The Doxen also have increased move speed which can make the game less of a hassle during laggy late-game scenarios since this mod tends to stress the simulation speed. The vehicle factory builds fabricators and scouts, which can build advanced dox. The bot factory builds the infamous Doxen. Giant Doxen are the main T2 unit. They have thick lasers and crush units below them, including structures. 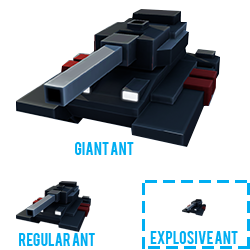 They become most effective when used in packs, because the lasers have AOE and can destroy large groups of T1 dox. 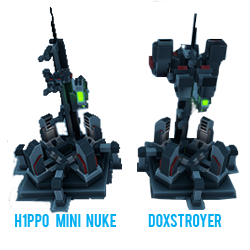 The dox shellers are meant to be support units for dox and giant dox because they are great at taking out large, balled up groups of dox. They are also cheaper than giant dox and have a longer range. 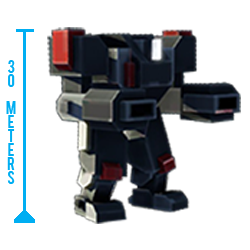 Like Boom Bot Wars, the Vanguard role is replaced with a heavily armored unit that acts like a shield. In Dox4Lyf, the Borv has a weak flamethrower that decimates tight groups of dox if they get too close. It also self-destructs when in close proximity to enemy units. These super units are made by the advanced combat fabrication bots and are meant to end games, usually. They have an electric lightning-bolt shotgun and longer ranged laser. They also can crush units below. One of the main reasons why this unit can be useful is that it explodes in a mini nuke explosion, destroying enormous groups of units around it. It can be VERY cost effective this way. The H1PP0 Mini nuke and it’s bigger brother, the Doxstroyer, are the two nukes in Dox4lyf. The H1PP0 will be able to accurately target any structure, making it more of a tactical missile than a nuke. The Doxstroyer is just like the vanilla nuke, it doxstroys anything it hits! Ant4lyf is a much slower paced version of the series, and does not cause horrific lag like Dox4lyf does late-game. Fabricators and combat fabs are the other units available in the vehicle factory. The ants are normal, but they have increased health to make battles last longer. Explosive mini ants are super fast and deal lots of damage to structures but are weaker against units compared to regular ants, and are terrible at sniping the commander due to an armor type. Ant Shellers fire explosive mini ants, and fill the same role as Dox4lyf and Boom Bot Wars. Use them to counter explosive ants and even the experimental ants! Giant Ants are the T2 version of the ants. They have very high HP and shoot a rocket projectile that annihilates anything it hits, and deals huge splash damage to the rest of a group. They can crush anything below them with their treads. Explosive Ants are the ones you really dont want to see coming at your base. 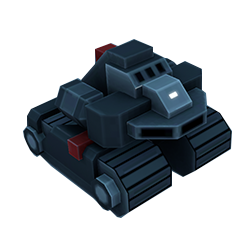 With their super fast speed like boom bots, they will destroy your base in seconds if they can get past your army. It’s definitely a good idea to have radar! Experimental, T3 Uber Ants are massive, buffed up tanks with side mounted guns and double barrel cannons. 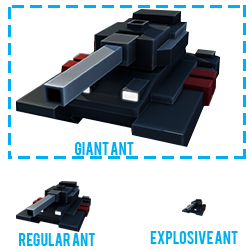 These tanks will easily annihilate anything in a 1v1, even the commander. They have 600 DPS and over 20,000 HP, making them virtually invincible. 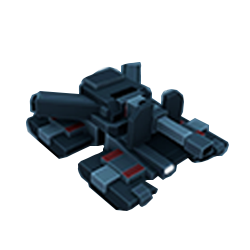 There is no need to micro these beasts, and they become less effective when microed anyway since the turn speed is incredibly slow, making them more of a battleship. An updated Leveler model was used to create this monster. They can be built by the advanced combat fabricator. The OHM Wrecker and the Tactical Ant missile are the two nukes in Ant4lyf. 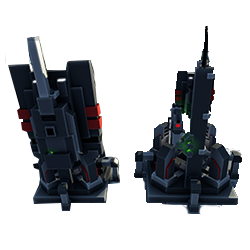 You’ll definitely want to have lots of antinukes, because the cheap Tactical Ant will be able to snipe almost any structure, including the commander. The Borv is just like the unit from Dox4lyf, except it has an improved flamethrower to counter explosive ants. 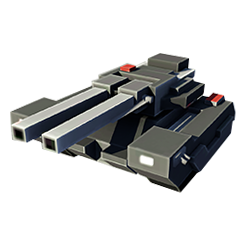 Use them as shields, and when combined with Giant ants or experimental ants, you have a force that is almost unstoppable. Doxnukes you gotta love them!